Gunnel bobbing, one of the simple joys of summer...if you are young enough to actually be able to do it. Sadly, my days for this pleasure are behind me. We were walking along the path at camp when I say the girls out on the lake doing this. 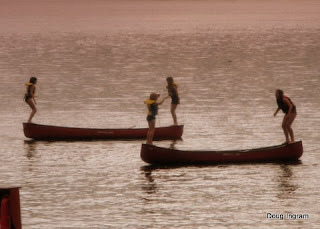 In addition to being fun, it teaches balance and confidence with the canoe. This activity is immediately followed by teaching canoe over canoe rescue. Posted by Doug Ingram at 9:40 a.m.